Wacom Cintiq 22HD 21-Inch is our top choice because it is the best large-screen drawing monitor on the market. It offers full HD resolution and an extra-wide viewing angle and reclines like an easel and freely rotates up to 180 degrees. What’s the best technology tool you’ve ever used? 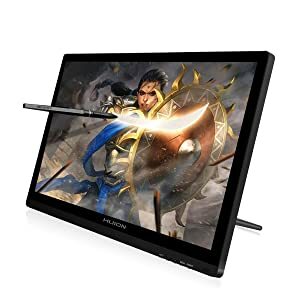 For artists and graphic designers, the answer is likely a drawing monitor (drawing tablet with a built-in touchscreen display). They let you draw on a screen in a way that feels remarkably similar to pen or brush on paper. The results can be pretty incredible, thanks to pressure sensitivity and other features. Sounds good, right? But be careful! There are a ton of terrible drawing tablets out there. In the quest to find the right one for me, I weeded through the duds and found only the best. You can benefit from my research, as I created this list of the 10 best drawing monitors, broken down by size. A lot of artists and designers prefer having a large screen. Below are the best large screens, sized between 19 and 22 inches. 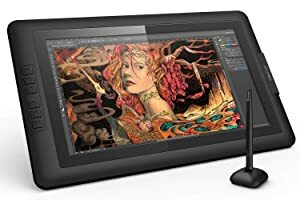 Wacom has been the leading brand for drawing monitors for many years and it’s the go-to choice for many artists and graphic designers. With a response rate of 14ms, it responds nimbly to your pen. Thanks to advanced pressure and tilt-sensitive technology, the pen will actually replicate the feel of working with not just a pen but also with markers and brushes. The Grip Pen recognizes 2048 levels of pressure. To help you sketch even more quickly, you are able to customize ExpressKeys™ that let you save the shortcuts you use most often. This 21.5″ screen offers full HD resolution and an extra-wide viewing angle. You are able to adjust the tablet’s display in a number of ways, allowing your workspace to be ergonomically sound. It reclines like an easel and freely rotates up to 180 degrees in either direction, allowing you to quickly and easily change your viewing angle. You can also lay it flat or attach it to an articulating arm, though that is sold separately. Though it has a few not insignificant negatives, the Wacom Cintiq 22HD 21-Inch is the best large-screen drawing monitor on the market. This 19″ drawing tablet from Ugee uses electromagnetic pressure sensitivity. It recognizes 2048 different levels of pressure sensitivity. This gives you a lot of control to draw and allows you to mimic a number of different drawing or painting tools. The high-res LCD monitor screen is protected with tough, shock-proof and anti-scratch glass. This also comes with an additional screen protector for even more protection. A 3-in-1 cleaning kit is included as well, so you can keep the screen looking great. The stable stand is anti-skid, and allows for multi-angle positional adjustment. Response time is even better than the Wacom, at 5ms with a report rate of 220 reports/per second. That this drawing monitor comes with two pens is a nice bonus. This allows you to keep one pen charged at all times so you never have to interrupt your sketching session. The first version of the Huion GT-220 had some fairly big problems but this 2nd version is significantly improved. The large 21.5″ display features 6.7 million colors and a 1920×1080 (fullhd) resolution. The response is quite nimble, at 14ms. You receive two pens, featuring 2048 pressure levels to mimic a variety of drawing tools. Even better, you can get a free firmware upgrade for the pen to recognize an incredible 8192 different pressure levels for your drawings. Unfortunately, there is no tilt recognition, something that is likely to be a problem for certain kinds of artists like calligraphers. The pen is lightweight and is covered with a thin rubber to prevent slippage. You can easily find the right angle for you, with a wide viewing angle of 178 degrees and the ability to adjust quickly. 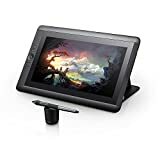 If you want the biggest screen size possible but find the price of a Wacom to be too steep, the Huion GT-220 is a good alternative if you do not need tilt recognition. If you don’t need the biggest size possible and have a bit less to spend, the Huion KAMVAS GT-191 is worth considering. In addition to being smaller and cheaper, though, it is also a bit slower. The response time is 25ms which is still fast enough to draw and sketch for most people but it is worth noting. It features a widescreen 16:9 ratio and 1920×1080 full HD resolution display. You don’t have quite as much control over viewing angle either at 20°~80° but that, too, will be plenty for most users. Like the other Huion, this graphic pad comes with two pens that offer an impressive 8192 levels of pressure sensitivity. The pen is ergonomically designed and quite comfortable to hold. A nice feature of this product is that it comes with nice pen stand with a built-in nib extractor and 8 spare nibs. You do also get an artist glove and a screen protector with this model. 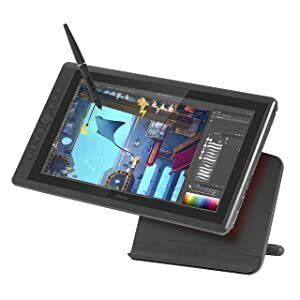 The Huion KAMVAS GT-191 is a very decent drawing tablet, especially for the price but it does have a slower response time compared to other tablets and is known to be a bit buggy. Although a lot of artists and designers love the flexibility and quailty of a huge screen, for most users the standard 15.6″ screen size is big enough. Here are the best options for this standard screen size. 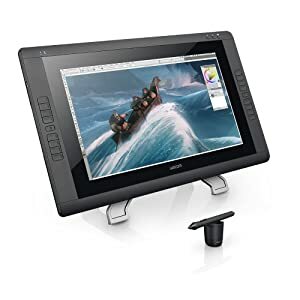 Wacom has been one of the leading brands for drawing monitors for many years and it’s the go-to choice for many artists and graphic designers. With a response rate of 14ms, it responds nimbly to your pen. Thanks to advanced pressure and tilt-sensitive technology, the pen will actually replicate the feel of working with not just a pen but also with markers and brushes for realistic drawings. The Grip Pen recognizes 2048 levels of pressure. To help you work even more quickly, you are able to customize ExpressKeys™ that let you save the shortcuts you use most often. As a major bonus, this does give you the option of setting the 10 available shortcut keys. To have this feature included in a product that is so affordable offers a lot of value. 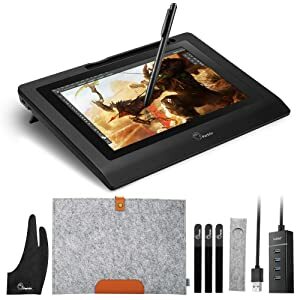 Unlike many other drawing tablets that use several cords, this one has a 3-in-1 cable so you only have to deal with one cord. The adjustable stand is ergonomically designed and comfortable to use no matter your preferred viewing angle. For the left-handed artist, there is the ability to use the tablet in left-handed mode, a huge advantage for the creative lefties out there. The GAOMON PD1560 digital tablet has a few issues but it is without question the best drawing monitor you can get for the price. 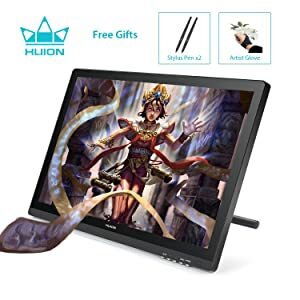 This is another drawing monitor that has really great reviews from buyers. It has a unique Passive Pen design that doesn't require charging but is still able to recognize 8192 levels of pressure sensitivity. The widescreen 1920x1080 display offers a vivid picture and you get 178° degree of visual angle. There are 6 fully customizable express keys, letting you save your favorite settings for near-instant access. This does not come with a stand, but there is a nice one available to purchase separately. Although you don't get a stand, there are some extras included like a pen stand with extra nibs, a drawing glove, and a cleaning cloth. The tablet is ultra-thin at only 11 mm. This is another option that will work well for lefties as well as the right-handed crowd. It also has a 3-in-1 cable design so you don't have to worry about excess cord clutter. There is a built-in screen protector that does a decent job without compromising response time or sensitivity. The XP-Pen Artist 15.6” has some fairly significant downsides but it’s a more than decent drawing tablet for the price and stands out for its unique passive pen design. A common problem with drawing monitors is that the color accuracy isn't quite equivalent to what you see on a computer screen. This tablet features 94% Adobe RGB accuracy, allowing for a more accurate color display. The Artisul Freestyle Stand is quite good and lets you easily adjust to find the perfect angle. Also adding to your convenience, there are 7 customizable FastAccess Buttons and a QuickDial to make it perfect for you. The pen is another battery-free option that still is able to recognize 8192 levels of pressure. The response time is quite fast, at 19ms. The convenience of portability is very attractive to many artists and designers. 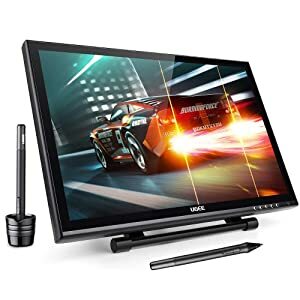 Many people prefer to have a larger drawing monitor at their home base and a second smaller, portable option to take on the road. Here are the best portable options. Wacom has been the gold standard brand for artists for a while. 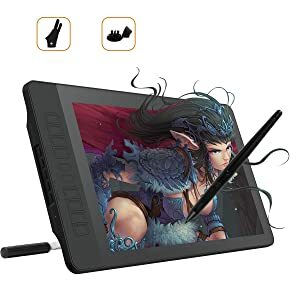 This portable 13" model isn't quite as good as the large screen Cintiq 22HD 21-Inch model but it is definitely the best small drawing tablet option available. It recognizes 2048 pressure levels and it is tilt-sensitive, a major advantage especially for certain kinds of artists. The wide viewing angle screen offers excellent HD resolution. This tablet comes with a stand that lets you adjust the angle. Unfortunately, there are only 3 settings for this so it's not as flexible as some of the other drawing monitors. It's easy to save shortcuts to customizable ExpressKeys, allowing you to save a lot of time. While this tablet will work with many different software programs, it does also come with a download key for some creative software. This graphic pad will work well with both PC and Mac computers. Wacom drawing tablets always rise to the top for their superior sensitivity, flexibility, and control and the highly portable Wacom Cintiq 13 HD is no exception. It's a good idea to keep your drawing tablet in some kind of case when transporting it. The Parblo 10.1" tablet comes with such a case, an attractive wool liner. This protects it from getting scratched or damaged while you're on the go. A cordless, battery-free pen is another nice feature of this tablet. The lack of a battery makes this pen really lightweight, making it feel more like a real pen in your hand. The response time is quite fast, at 16ms. This tablet has an ergonomic design and a viewing angle of horizontal 170° and vertical 170°. The Parblo 10.1” is a decent small-size drawing tablet and it comes with really nice carrying case. This low-cost option offers a lot of value. The 10.1" screen offers 1280x800 resolution with a 16:10 display and a 178° visual angle. The picture is quite vivid. There is an anti-glare coating that does an excellent job of minimizing reflection. A button for adjusting brightness is another nice touch. The battery-free pen offers 2048-level pressure sensitivity. It's easy to use whether you are right or left handed. Unless you're one of the rare artists who is perfectly accurate all the time, you'll appreciate the easy access to eraser functionality. There are also 6 customizable Express Keys to save your favorites. A 3-in-1 cable minimizes cord clutter and the ultra-thin design is lightweight and easily portable. Because of its low cost and its ease of use, the XP-Pen Artist10S digital tablet is a great introduction to drawing tablets for beginners or anyone on a budget. What type of screen protector can be used on these tablets? 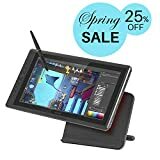 Some of these tablets, like the Wacom 21" have an anti-glare and anti-scratch coating right on the tablet, eliminating the need for a screen protector. Others, like the Ugee 19" and the GAOMON PD1560, come with a screen protector. For those that don't have a built-in protection element or that don't come with a screen protector, you should be able to use any tablet screen protector that is the appropriate size. It is worth pointing out, though, that screen protectors might impact the sensitivity slightly. With a drawing monitor, that might be a big problem. You should look for a screen protector that is as thin as possible. A matte protector also might be slightly better in this regard. Drawing monitor vs phablets - what are the pros & cons? The advent of quality tablets like Apple's iPad and Android-based models from Samsung and others introduced some decent competition to dedicated drawing monitors. That said, they can't really compete for a serious artist or professional graphic designer. For the hobbyist, a tablet with a stylus will probably be good enough. You will not have access to as much customization, though, and you will have a much smaller range of pressure settings. A tablet with a stylus is a good way to get started with digital art before graduating to the use of a drawing monitor. A big con of good drawing monitors is that they are a fairly steep investment. They do, however, give you so much more flexibility and control. For the serious artist, the investment ends up more than paying for itself. Which one is good for beginners? That depends on the beginner in question. 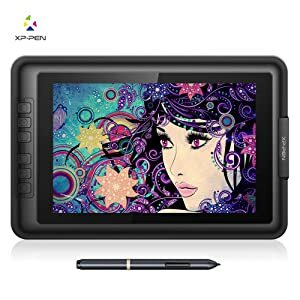 For the hobbyist just looking to try digital art creation, or learning to draw, a low-cost model like the XP-Pen Artist10S is probably the best choice. This lets them learn and experience the basics of what a tool like this can do. Upgrading to a nicer model down the line is then a good option if it's a good fit. For the beginner who is a more serious artist that already uses sketching tools and programs like Photoshop for digital art creation or graphic design work, it makes sense to just dive right in with a top of the line model. It doesn't get any better than the Wacom Cintiq 22HD 21-Inch. For someone in between, the GAOMON PD1560 is a perfect choice. It offers a great value, is very highly reviewed, and is very user-friendly. What drawing touchscreen will work best with Adobe Photoshop? Most of the drawing monitors on this list will work really well with Photoshop. It might be easier to point out which ones aren't compatible. The Parblo 10.1” does not work very well with Photoshop. The XP-Pen Artist 15.6” will work with Photoshop CC but not with older versions of the Adobe Suite like CS6. The other drawing touchscreen tools on this list will work with Photoshop. In fact, using one of these drawing tablets with Photoshop is a serious gamechanger. The Wacom tablets work particularly well with Photoshop. How do dedicated drawing screens compare to an Apple iPad? The iPad has definitely created a solid competitor to the dedicated drawing tablet. it largely comes down to a matter of personal preference. There are plenty of artists and graphic designers who swear by the iPad and describe it as the best digital drawing experience possible. Other say that using a drawing monitor gives a feeling that is closer to pen on paper. The major advantage of a dedicated drawing screen is that it connects to your computer, allowing you to use it directly with programs like Adobe Photoshop. Drawing monitors also generally have better out-of-the-box pressure sensitivity settings. The Apple Pencil does have a lot of flexibility with pressure levels but you do have to do a lot of customization and calibration to use it effectively. A dedicated drawing screen and pen is easier to use and doesn't require as much fuss to get started. Have you ever used a drawing monitor? Do you have any tips for using this tool? Please share in the comments. If you want to add a drawing monitor to your arsenal, what are you looking for? Do you have your eye on any of the models on this list?